The organizers would be wishing she was made the Chief launcher as well as mother of the day after former First lady, Mrs Maryam Abacha, yesterday stole the show at the launch of a book written by her former Military press secretary, Colonel John Adache (rtd). Mrs Abacha strolled into the conference Hall of the National Defence Collage, NDC, named after her husband Sanni Abacha, in company of her son, Mohammed and a retinue of well-wishers. At the launch of the book on ‘The Military and Public Relations; Issues Strategies and Challenges’, the Chief launcher donated N2 million, but the former First lady who is the mother of the day announced, her family’s donation of N5 million and threw the whole hall into loud ovation, with everyone believing the highest donation of the night would be the Chief launcher’s. While urging the military to continue to live up to the challenge through making strides in research and scholarship, the Commandant noted that the Collage will continue to hold its place prominently amongst its pears globally. He added that the publication of the book was very timely as public relations practiced by most complex organizations are being given greater impetus especially with the advent of globalization enhanced by varied modes of modern communications. He added that the military cannot afford to be left behind. Celebrating the Abacha’s family is like celebrating criminals..
you got it right man. 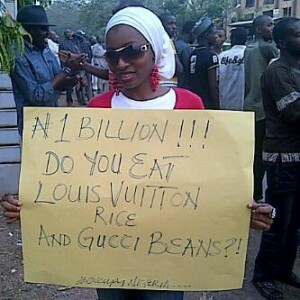 Using Nigeria’s money to impress Nigerians.what a pity! I wholeheartedly agree with you, what a pity. Obviously a better family than,say,the Obj family or even the Igbinedion family,no?